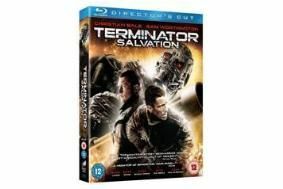 Terminator Salvation out on Blu-ray disc today | What Hi-Fi? * "Re-Forging the Future", an exclusive behind-the-scenes look at the film's production. * The "Moto-Terminator", a featurette revealing how the film's visual effects crew and motorcycle manufacturer Ducati created the deadly Moto-Terminators. * 11 mini featurette focus points spotlighting how the spectacular special effects were created. The Blu-ray disc also includes McG's Director's Cut of the film with additional footage not shown in cinemas. And the Maximum Movie Mode allows viewers to watch the movie with film director McG plus Picture-in-Picture (PiP) commentary with cast and crew interviews. If your Blu-ray player is connected to the web, you can download ten "Terminator TechCom" videos from the BD Live section of the disc, plus updated film information via movieIQ and cinechat, a feature allowing the viewer to chat live with friends around the world while watching the film. As well as a full HD 1080p picture, Terminator Salvation has a DTS-HD Master Audio soundtrack which we can't wait to hear. The film features Christian Bale (Batman Begins, The Dark Knight) who stars as John Connor, and Sam Worthington (Avatar) as Marcus Wright. We'll bring you a full review of the Blu-ray version of the film here on whathifi.com shortly.